The role of p27 in cytoskeleton dynamics is less consolidated and has long presented controversial aspects. In 1998, the group of Dowdy et al. firstly reported that hepatocellular carcinoma cells, transduced with TAT-p27 fusion protein, rearranged actin cytoskeleton forming lamellipodia and filopodia in a 2D-assay . Later on, the same authors postulated that this pro-migratory effect of p27 required Rac1, a GTPase protein known as a regulator of actin remodeling . Many other evidences from different groups contributed to clarify the role(s) of p27 in the control of cytoskeletal dynamics, in some cases involving Rac1, RhoA or citron-kinase and resulting in the control of actin assembly and actomyosin contractile ring formation during cytokinesis [7–9]; in other cases involving stathmin 1 (hereafter referred as stathmin, STM) and resulting in the control of microtubule (MT) dynamics . As expected, p27 regulation of cytoskeleton organization affected cell shape and motility and, depending on the context, resulted in either pro- or anti-migratory effects, as recently reviewed by Sharma et al . On the contrary, using human sarcoma cells and oncogene-transformed Murine Embryonic Fibroblasts (MEFs) as model systems and 3D-assays to test cell motility, our group observed a strong anti-migratory and anti-metastatic activity of p27, linked to its C-terminal portion (aa 170–198) [10, 17–19]. Furthermore, in xenograft models, the expression of p27WT, but not of p27 deleted of the last 28 aa (p271–170), strongly prevented v-Src or H-Ras transformed cells from invading blood vessels and forming distant metastasis [17, 19]. The molecular dissection of these anti-migratory effects led to the discovery that the binding of p27 to stathmin via its C-terminus could be regulated by the phosphorylation on T198 and resulted in impaired stathmin activity [10, 20]. Stathmin is an MT-destabilizing protein often overexpressed in metastatic tumors . 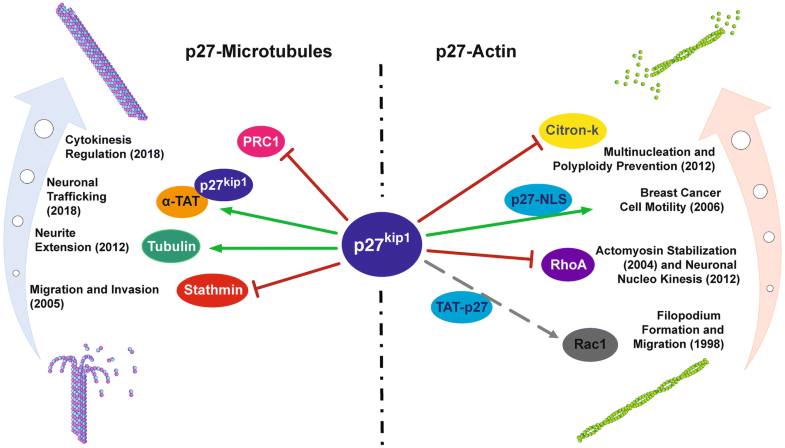 By interacting with p27, stathmin ability to bind MTs decreased, thereby decreasing its MT-destabilizing activity. Conversely, high stathmin expression/activity favored the acquisition of amoeboid-like cell motility , by regulating RhoA in a MT-dependent manner . Accordingly, the amoeboid-like motility that characterized v-Src-transformed p27KO or mutant p271–170 fibroblasts could be reverted by RhoA pathway inhibition or by low doses of Taxol, which led to MT-stabilization. A still unclear point in the biology of p27 is how (and why) a relatively short sequence of approx 100 amino acids can mediate so many interactions. Noteworthy, this sequence lacks clear functional domain(s), with the exception of the above-mentioned NLS. It has been reported that different regions of p27 protein retain the characteristics of intrinsically disordered regions (IDR), a peculiar non folded 3D conformation that confers the ability to bind to several different targets [38–40]. It is well recognized that the intrinsic lack of structure confers functional advantages, including the promiscuous interaction with a large number of “partners” and, also, the possibility to engage several upstream regulatory pathways leading to specific protein post-translational modifications. Noteworthy, p27 C-terminus contains several phosphorylable residues that are already known to determine its stability, localization and interaction preferences. It is therefore possible that the IDR conformation confers to p27 peculiar signaling and regulatory functions in different contexts, as the literature collected so far seems to indicate. The fact that many of these activities are related to the regulation of MT-dynamics supports the concept that p27 may act as a central relay, linking the control of cell division to other interphase MT-mediated processes, such as intracellular trafficking, cell motility, and differentiation.